Strength + beauty. For the love of urban industrial, comes a dichotomous blend of utilitarian metal designs and the beauty of raw steel & iron finishes. For the hard-core industrial vibe, choose vintage medicine cabinets, adjustable industrial cast iron tables with glass or marble tops, and for the true industrialist ~ concrete seating. What more could you want for your urban cool, urban industrial lifestyle? [lifestyle photo by gary heller photography]. 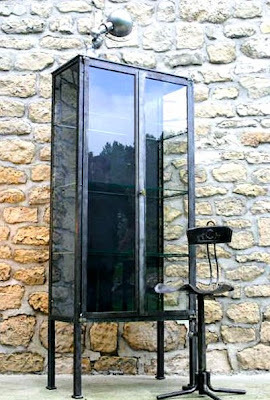 1940's strafor medicine cabinet, by Les Nouveaux Brocanteurs brings utility + beauty + industrial design to any urban decor dwelling or big city loft. 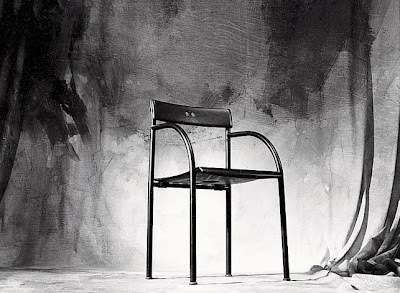 [photo by Régis Cariou]. 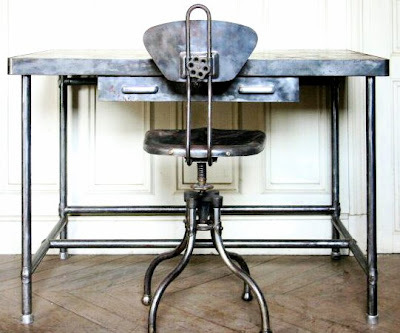 Design Collection from French Design House ~ Les Nouveaux Brocanteurs, titled "Indus & Métiers," is an urban industrial dream find and I have to thank the very talented + creative, photographer Régis Cariou for introducing me to such urban industrial coolness. 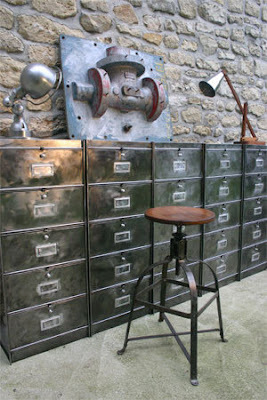 Find Régis and the other talented design team members at Les Nouveaux Brocanteurs or visit www.lesnouveauxbrocanteurs.com for more fabulous industrial wares. For the true vintage urban industrial enthusiast: a must see urban cool loft filled with one-of-a-kind antique industrial wares + lighting. 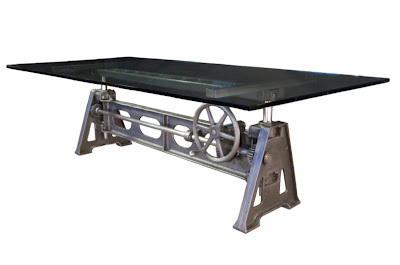 "It has always been our goal at Get Back, Inc. to find the best in unique industrial design. Started in 2000 by Irish cabinet/furniture makers, experienced in "Old World" craftsmanship, our ability to transform our finds into functional exciting furniture has attracted many top architects, designers, and decorators." 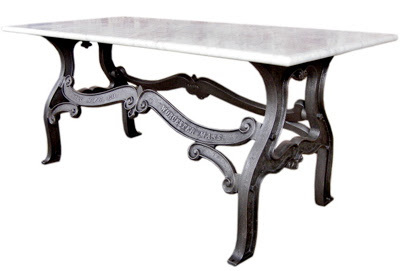 ~ GB, Inc.
[the goods on the tables: *1. adjustable industrial cast iron & glass table base, *2. vintage industrial marble & cast iron table]. 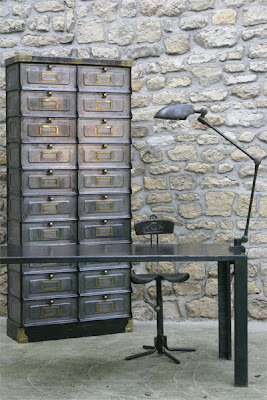 For pricing + additional information, visit the urban cool crew at Get Back, Inc.
i LOVE the industrial look. excellent pics! I'm very into industrail chic, but that might be pushing it just a bit! All items look good but i like the tables great stuff! invigorating design. Thank you for sharing! 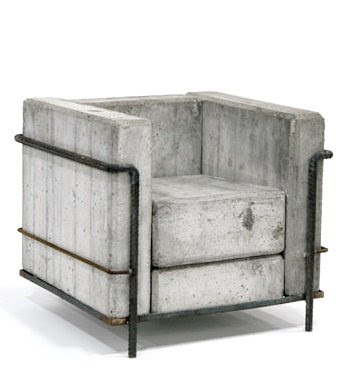 Love the concrete chair. It needs a pillow. That first medicine cab is incredible!! Good to find your site! wow, just stumbled upon your blog and loving it! Exceptional Design for most of the items. 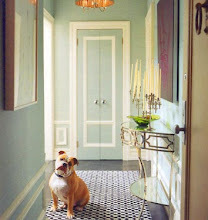 One or two pieces will be perfect in any house. Fantastic images. 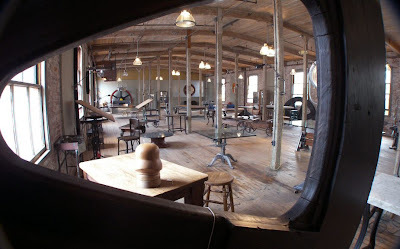 I very much like and admire the industrial design look in some interiors. The old medicine cabinet is superb. 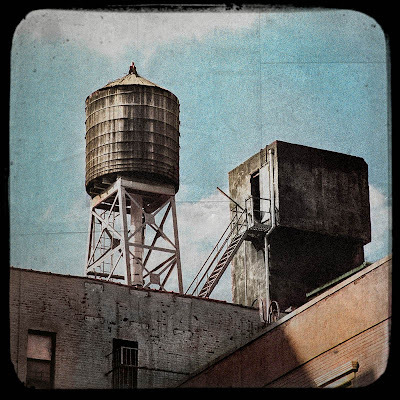 Thank you for honoring my "New York Water Towers 5" photograph in this. Also, I am madly in love with those tables. The industrial look makes me think of how "dusty" those times were back then. Oh my wow. 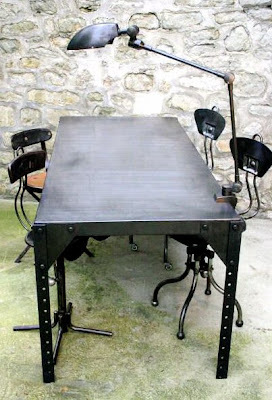 This is an awesome collection of industrial at it's finest! 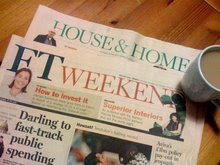 Great blog I'll be bookmarking! Great pictures I really love this style. I def. will be back and link you ! Hi Susan, my father was a doctor and he has the first one piece and he sold it!!! What a pity, i loved it but I had no place to keep it!